The Digidesign 192 i/o. A digital audio interface for the Pro Tools computer-based hard disk recording system. Digital audio quality is measured in data resolution per channel. Prior to the development of multitracking, the sound recording process required all of the singers, band instrumentalists, and/or orchestra accompanists to perform at the same time in the same space. Multitrack recording was a significant technical improvement as it allowed studio engineers to record all of the instruments and vocals for a piece of music separately. Multitracking allowed the engineer to adjust the levels and tone of each individual track, and if necessary, redo certain tracks or overdub parts of the track to correct errors or get a better "take." As well, different electronic effects such as reverb could be applied to specific tracks, such as the lead vocals, while not being applied to other tracks where this effect would not be desirable (e.g., on the electric bass). Multitrack recording was much more than a technical innovation; it also enabled record producers and artists to create new sounds that would be impossible to create outside of the studio, such as a lead singer adding many harmony vocals with their own voice to their own lead vocal part, an electric guitar player playing many harmony parts along with their own guitar solo, or even recording the drums and replaying the track backwards for an unusual effect. In the 1980s and 1990s, computers provided means by which both sound recording and reproduction could be digitized, revolutionizing audio recording and distribution. In the 2000s, multitracking hardware and software for computers was of sufficient quality to be widely used for high-end audio recordings by both professional sound engineers and by bands recording without studios using widely available programs, which can be used on a high-end laptop computer. Though magnetic tape has not been replaced as a recording medium, the advantages of non-linear editing (NLE) and recording have resulted in digital systems largely superseding tape. Even in the 2010s, with digital multitracking being the dominant technology, the original word "track" is still used by audio engineers. 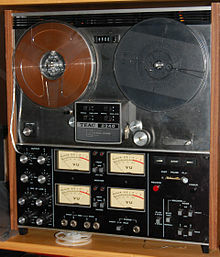 Multi-tracking can be achieved with analogue recording, tape-based equipment (from simple, late-1970s cassette-based four track Portastudios, to eight track cassette machines, to 2" reel-to-reel 24-track machines), digital equipment that relies on tape storage of recorded digital data (such as ADAT eight-track machines) and hard disk-based systems often employing a computer and audio recording software. Multi-track recording devices vary in their specifications, such as the number of simultaneous tracks available for recording at any one time; in the case of tape-based systems this is limited by, among other factors, the physical size of the tape employed. With the introduction of SMPTE timecode in the early 1970s, engineers began to use computers to perfectly synchronize separate audio and video playback, or multiple audio tape machines. In this system, one track of each machine carried the timecode signal, while the remaining tracks were available for sound recording. Some large studios were able to link multiple 24-track machines together. An extreme example of this occurred in 1982, when the rock group Toto recorded parts of Toto IV on three synchronized 24-track machines. This setup theoretically provided for up to 69 audio tracks, which is far more than necessary for most recording projects. For computer-based systems, the trend in the 2000s is towards unlimited numbers of record/playback tracks, although issues such as RAM memory and CPU available do limit this from machine to machine. Moreover, on computer-based systems, the number of simultaneously available recording tracks is limited by the number of sound card discrete analog or digital inputs. When recording, audio engineers can select which track (or tracks) on the device will be used for each instrument, voice, or other input and can even blend one track with two instruments to vary the music and sound options available. At any given point on the tape, any of the tracks on the recording device can be recording or playing back using sel-sync or Selective Synchronous recording. This allows an artist to be able to record onto track 2 and, simultaneously, listen to track 1, 3 and 7, allowing them to sing or to play an accompaniment to the performance already recorded on these tracks. They might then record an alternate version on track 4 while listening to the other tracks. All the tracks can then be played back in perfect synchrony, as if they had originally been played and recorded together. This can be repeated until all of the available tracks have been used, or in some cases, reused. During mix down a separate set of playback heads with higher fidelity are used. Before all tracks are filled, any number of existing tracks can be "bounced" into one or two tracks, and the original tracks erased, making more room for more tracks to be reused for fresh recording. In 1963, The Beatles were using twin track for Please Please Me. The Beatles' producer George Martin used this technique extensively to achieve multiple track results, while still being limited to using only multiple four-track machines, until an eight-track machine became available during the recording of the Beatles' White Album. The Beach Boys' Pet Sounds also made innovative use of multitracking with 8-track machines of the day (circa 1965). Motown also began recording with 8-track machines in 1965 before moving to 16-track machines in mid-1969. During multitracking, multiple musical instruments (and vocals) can be recorded, either one at a time or simultaneously, onto individual tracks, so that the sounds thus recorded can be accessed, processed and manipulated individually to produce the desired results. In the 2010s, many rock and pop bands record each part of the song one after the other. First, the bass and drums are often recorded, followed by the chordal rhythm section instruments. Then the lead vocals and guitar solos are added. As a last step, the harmony vocals are added. On the other hand, orchestras are always recorded with all 70 to 100 instrumentalists playing their parts simultaneously. If each group of instrument has its own microphone, and each instrument with a solo melody has its own microphone, the different microphones can record on multiple tracks simultaneously. After recording the orchestra, the record producer and conductor can adjust the balance and tone of the different instrument sections and solo instruments, because each section and solo instrument was recorded to its own track. With the rock or pop band example, after recording some parts of a song, an artist might listen to only the guitar part, by 'muting' all the tracks except the one on which the guitar was recorded. If one then wanted to listen to the lead vocals in isolation, one would do so by muting all the tracks apart from the lead vocals track. If one wanted to listen to the entire song, one could do so by un-muting all the tracks. If one did not like the guitar part, or found a mistake in it, and wanted to replace it, one could do so by re-recording only the guitar part (i.e., re-recording only the track on which the guitar was recorded), rather than re-recording the entire song. If all the voices and instruments in a recording are individually recorded on distinct tracks, then the artist is able to retain complete control over the final sculpting of the song, during the mix-down (re-recording to two stereo tracks for mass distribution) phase. For example, if an artist wanted to apply one effects unit to a synthesizer part, a different effect to a guitar part, a 'chorused reverb' effect to the lead vocals, and different effects to all the drums and percussion instruments, they could not do so if they had all been originally recorded together onto the same track. However, if they had been recorded onto separate tracks, then the artist could blend and alter all of the instrument and vocal sounds with complete freedom. The process was conceived and developed by Ross Snyder at Ampex in 1955 resulting in the first Sel-Sync machine, an 8-track machine which used one-inch tape. This 8-track recorder was sold to the American guitarist, songwriter, luthier, and inventor Les Paul for $10,000. It became known as the "Octopus". Les Paul, Mary Ford and Patti Page used the technology in the late 1950s to enhance vocals and instruments. From these beginnings, it evolved in subsequent decades into a mainstream recording technique. Since the early 1990s, many performers have recorded music using only a Mac or PC equipped with multitrack recording software as a tracking machine. The computer must have a sound card or other type of digital audio interface with one or more Analog-to-digital converters. Microphones are needed to record the sounds of vocalists or acoustic instruments. Depending on the capabilities of the system, some instruments, such as a synthesizer or electric guitar, can also be sent to an interface directly using Line level or MIDI inputs. Direct inputs eliminate the need for microphones and can provide another range of sound control options. There are tremendous differences in computer audio interfaces. Such units vary widely in price, sound quality, and flexibility. The most basic interfaces use audio circuitry that is built into the computer motherboard. The most sophisticated audio interfaces are external units of professional studio quality which can cost thousands of dollars. Professional interfaces usually use one or more IEEE 1394 (commonly known as FireWire) connections. Other types of interfaces may use internal PCI cards, or external USB connections. 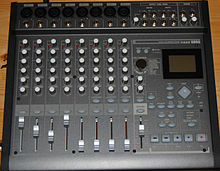 Popular manufacturers of high quality interfaces include Apogee Electronics, Avid Audio (formerly Digidesign), Echo Digital Audio, Focusrite, MOTU, RME Audio, M-Audio and PreSonus. Microphones are often designed for highly specific applications and have a major effect on recording quality. A single studio quality microphone can cost $5,000 or more, while consumer quality recording microphones can be bought for less than $50 each. Microphones also need some type of microphone preamplifier to prepare the signal for use by other equipment. These preamplifiers can also have a major effect on the sound and come in different price ranges, physical configurations, and capability levels. Microphone preamplifiers may be external units or a built in feature of other audio equipment. Multitrack recording software can record multiple tracks at once. It generally uses graphic notation for an interface and offers a number of views of the music. Most multitrackers also provide audio playback capability. Some multitrack software also provides MIDI playback functions not just for audio; during playback the MIDI data is sent to a softsynth or virtual instrument (e.g., VSTi) which converts the data to audio sound. Multitrack software may also provide other features that qualify it being called a digital audio workstation (DAW). These features may include various displays including showing the score of the music, as well as editing capability. There is often overlap between many of the categories of musical software. In this case scorewriters and full featured multitrackers such as DAWs have similar features for playback, but may have less similarity for editing and recording. Multitrack recording software varies widely in price and capability. Popular multitrack recording software programs include: Propellerhead Reason, Ableton Live, FL Studio, Adobe Audition, Pro Tools, Digital Performer, Cakewalk Sonar, Samplitude, Nuendo, Cubase and Logic. Lower cost alternatives include Mixcraft, REAPER and n-Track Studio. Open-source and Free software programs are also available for multitrack recording. These range from very basic programs such as Audacity and Jokosher to Ardour, which is capable of performing many functions of the most sophisticated programs. In modern popular songs, drums, percussion instruments  and electric bass are often among the first instruments to be recorded. These are the core instruments of the rhythm section. Musicians recording later tracks use the precise attack of the drum sounds as a rhythmic guide. In some styles, the drums may be recorded for a few bars and then looped. Click (metronome) tracks are also often used as the first sound to be recorded, especially when the drummer is not available for the initial recording, and/or the final mix will be synchronized with motion picture and/or video images. One reason that a band may start with just the drums is because this allows the band to pick the song's key later on. The producer and the musicians can experiment with the song's key and arrangement against the basic rhythm track. Also, though the drums might eventually be mixed down to a couple of tracks, each individual drum and percussion instrument might be initially recorded to its own individual track. The drums and percussion combined can occupy a large number of tracks utilized in a recording. This is done so that each percussion instrument can be processed individually for maximum effect. Equalization (or EQ) is often used on individual drums, to bring out each one's characteristic sound. The last tracks recorded are often the vocals (though a temporary vocal track may be recorded early on either as a reference or to guide subsequent musicians; this is sometimes called a "Guide Vocal", "Ghost Vocal" or "Scratch vocal"). One reason for this is that singers will often temper their vocal expression in accordance with the accompaniment. Producers and songwriters can also use the guide/scratch vocal when they have not quite ironed out all the lyrics or for flexibility based on who sings the lead vocal (as The Alan Parsons Project's Eric Woolfson often did). ^ Classic Tracks: Toto's "Africa", Mixonline.com, Retrieved June 30, 2015. ^ Martin, George (1994). All You Need is Ears. St Martin's Press. p. 304.